With the sad loss of MassArt's beloved Punk Rock Flea Market, a few crafty alums of the school have put together a new incarnation that should prove to be just as successful! 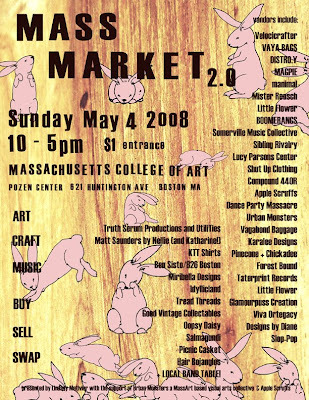 The Mass Market, a DIY flea market featuring local artisans, bands, book makers and the like will take place this Sunday, May 4th, 10am-5pm at Mass College of Art's Pozen Center. Come say hi, hear some music and check out the craftiest folks in Boston! 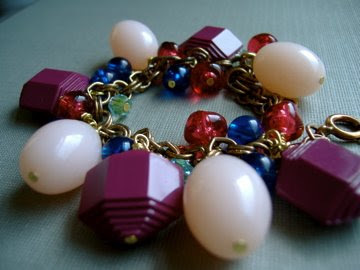 Among other local crafty favorites Distro.y, Ben Sisto and Pine Cone + Chickadee, Boston Handmade member Glamourpuss Creations will be featuring lots of bright spring colors like magenta and cobalt blue.